Starts with a Single Idea! 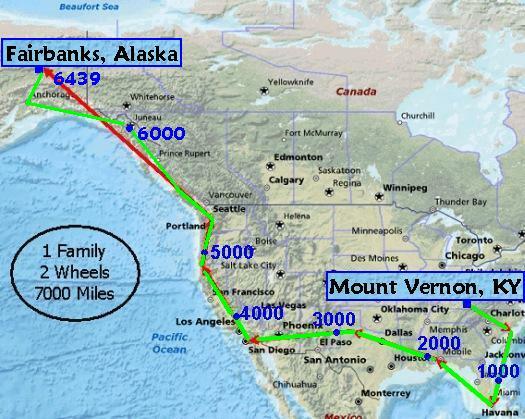 On January 1, 2009 we hatched the idea to travel from Kentucky to Alaska on a five person bicycle. A great way to show our girls the country. A great way to experience an abundance of life lessons. It took us seven months to get ready for the journey. To find the bicycle, to learn to ride it and to have all our ducks in a row at our home base. On August 1, 2009 we left our home in the mountains of Eastern Kentucky. We have traveled to the Atlantic Ocean, down into Florida, cross country to the Pacific Ocean and up into Alaska. After one year and 13 days, we have rolled into Fairbanks, Alaska! This is where we've started our next adventure. Winter in Fairbanks. If you've been following our journey, you are well aware of what has happened on our journey. Catch up on our earlier travels by clicking a link below. The journey from Kentucky to Alaska has been an unforgetable experience. We have come across hundreds and hundreds of people who have generously shared their lives with us. Whether it has been by inviting us into their homes, sharing a meal, or a financial donation. Without this abundance of generosity and love for live, we would not have made it this far. It takes our courage and determination to keep this journey going. It takes your involvement to make this journey such a powerful experience. We are very thankful that you have chosen to be a part of our lives. Thank you! Hatching an idea is one thing. Acting upon it is quite another. We have found the bicycle for our journey - the quint. We have practised with the quint - the training. We have planned the journey - the route. Leg 7 - Crescent City, California to Port Angeles, Washington. Leg 8a - Port Angeles, Washington to Prince Rupert, British Columbia. Leg 8b - Prince Rupert, British Columbia to Anchorage, Alaska. A year of travel gives a lot of information about where we spend the night, how many miles we travel per day and in which states we spend most of our time. We have made this information available in the Charts and Graphs page. We're the first family to cross the continent on a quint bicycle. Our unique way of travel has created a lot of media attention.